I have to admit, I wasn’t initially psyched about the prospect of a fourth Die Hard. Yes, I love the original trilogy, but 12 years is a large span of time for a franchise. Could Bruce Willis still play the role? Then the news about McClance being paired with a teenage sidekick and, worse still, a PG-13 rating, which could potentially strip the movie of everything we expect from a Die Hard, just made matters worse. But good pre-release hype (and the simple fact that it is a Die Hard movie) inspired me to go to the movie opening night. My initial reaction was that I was somehow imagining it; even my biggest hopes didn’t make me think the film would be as good as it is. Saying it is the most satisfying sequel of the summer is a total understatement. Live Free or Die Hard embodies everything a good action film needs (the standards the original Die Hard set in stone back in 1988) and then goes the extra mile. But the best thing about the film, the most undeniable part, is that John McClane is back in full glory. After Homeland Security is hacked, McClane gets a call at 2 in the morning to go pick up a young computer hacker and take him from New York to D.C. Anyone who knows this series knows that that doesn’t go as planned, and things continually go from bad to worse. The terrorists are systematically shutting down the United States, starting with phones, internet, and moving on to electricity, water, etc. And only McClane, the good ol’ fly in the ointment, “monkey in the wrench,” (along with Matt Farrell, the computer hacker) can stop them. The plot, though it doesn’t sound like it on paper, is as solid and traditional a Die Hard plot as you can imagine. It manages to keep a claustrophobic sense of confinement on McClane, like the original film did, even though it is spread across the entire East Coast. The plot takes plenty of good twists, and makes room for some great character development. The characters are all great. Bruce Willis slips back into John McClane with complete ease, and from his first line in the film, you know that everyone’s favorite cop is back, ready for another huge adventure. Willis has always made these movies what they are; without him, Die Hard would just be an average action flick, but he elevates it to a whole new level, and Live Free or Die Hard reminds us why we loved him in the first place. Justin Long plays his sidekick, Matt Farrell, a sarcastic, witty computer hacker, who acts and talks a bit like a young McClane, just without all the heroism. Surprisingly, he’s one of McClane’s best sidekicks, and is crucial to the story. The chemistry between the two is near-perfect. Timothy Olyphant portrays Thomas Gabriel, the film’s villain, and portrays the sense of madness and villainy fairly well. He’s not nearly the most menacing Die Hard villain, but he works for the movie; the real villains are the henchman anyway. Mary Elizabeth Winstead plays John’s estranged daughter, and does a great job channeling the McClane spirit. The action, as we’ve come to expect from this series, is spectacular. 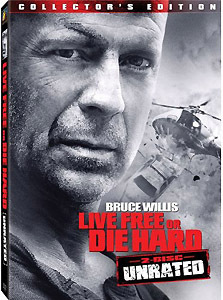 Live Free or Die Hard contains some of the series’ best action scenes, including a ridiculous but extremely exciting scene involving an F-35 jet, and a climax that will leave you smiling at the sheer brilliance of it. In theaters, all worries about the PG-13 rating were quickly dissolved. The action is so madcap and violent that I swore I was watching something rated R; the lack of any strong language was a bit disconcerting (I mean, how often does someone go through dozens of life-threatening situations without ever yelling out a strong obscenity?) but the film is so good you forget about it. However, this new “unrated” version (in reality, the original cut of the film before it was censored to get a PG-13) is a whole different cup of tea. Tonally, this fits with the original three films much better. For one, McClane’s dialogue is much more like we remember it; constantly muttering some rather strong curse words and using some more vulgar one liners, McClane is just as awesome as we remember him. I know it may sound a bit perverted to like to hear the hero swearing constantly, but McClane is supposed to embody the American everyman, and the American everyman does tend to swear a bit in their daily life; it’s a part of his character that we love. The violence has also been enhanced and other scenes have been altered. I like nearly every change for the Unrated cut, save for one, but it’s a small quibble. Both are presented on this DVD, and I’d recommend watching the Unrated cut, especially if you’re a big fan of the original films. However, the Unrated cut, if rated, would definitely be a strong R, so worried parents should show their kids the “Theatrical Cut,” rated PG-13. Upon inserting disc one, you are presented with your choice of viewing; either the Unrated or Theatrical version (presented via seamless branching technology). The video quality on both is exactly equal, and is phenomenal. Details is extremely sharp to the point where some shots look nearly hi-def. Colors are slightly muted throughout, but this was a choice on the part of the filmmakers and faithfully recreates the theatrical experience. Contrast is almost always sharp, complementing the color nicely. Overall, the video recreates the theatrical experience very well, which is good considering how new the film is. I was actually surprised not to find any compression artifacts, considering the film has 3 or 4 audio tracks, subtitles, all the branching info., etc, loaded onto the disc. The audio matches the video very well. Dialogue, when needed, usually takes prevalence over music and sound effects, but sometimes it becomes muffled and hard to hear. This is rare, however, and the audio usually stays sharp and exciting, enhancing the viewing experience. The only extra on Disc 1 is the audio commentary with Director Len Wiseman, Bruce Willis, and editor Mark Bomback. Wiseman talks the most, with Willis chiming in quite often and Bomback only giving his thoughts once in a while. Willis has the most interesting things to say, considering he actually has been on the project much longer than any of the others. It was cool to finally hear Willis on a Die Hard commentary; he didn’t record one for the two-disc sets of the first three films. In the first 10 minutes, they pack a lot of good information in, and on the entirety of the two-disc set, this commentary gives you the best idea of how the film was made. If you have time, at least listen to some of it. My only complaint is that they take long pauses that become rather tedious. I believe the commentary is only available on the Unrated cut. Disc two contains the rest of the features, many of them a bit under-whelming. First up is a one-hour (approx.) documentary about the film titled “Analog Hero in a Digital World: The Making of Live Free or Die Hard.” It’s split into about 10 parts with a play all function included. I usually love documentaries like this, but whoever put this together really fumbled on it. There’s hardly any on-set footage; it’s mostly the filmmakers talking about the plot and other elements; you don’t ever get a good idea of how they made the film. There’s good bits here and there that give you some insight, but they’re few and far between. You might want to sample it, but overall it’s not worth viewing the entire thing. The next feature gives you a much better idea about the creative process; entitled “Yippee-Ki-Yay Mother******!” this twenty minute Featurette is simply a conversation between Kevin Smith (the Wizard in the film) and Bruce Willis, while they sit outside in the Fox studios lot, a block away from Fox Plaza, the real building that became Nakatomi Plaza for the original film. Basically, Smith interviews Willis as a fan, not a filmmaker. Smith obviously loves Die Hard, and Willis has lots and lots of cool things to say. He talks about his career, the Die Hard films, and how he got involved with the new film. You get to know a lot about Bruce Willis; it’s easily the best feature on this whole set, and I highly recommend watching it. Next up is a music video of the song “Die Hard” by band Guyz Nite. The song has extremely clever lyrics summing up all four films, and is hilarious, set to clips from the series. It’s hard to describe, but I definitely recommend watching it. There’s also a making of for the music video which is silly and doesn’t belong on the DVD set. There’s also a 7-minute video entitled “Fox Legacy: Die Hard” in which a Fox executive talks about the franchise. It’s boring and pointless and is simply wasting space on the disc. There’s also the theatrical trailer, as well as previews for other Fox Films on DVD. Finally, if you put disc two in your computer, you can get a digital version of the film that you can watch on your computer or put on a video device (you can’t put it on I-pods, phones, PSP’s, etc., so I don’t know what video devices you can play it on). I hate watching movies on the computer, so I haven’t tried this yet. If you have a portable video device that will support the file, this is a pretty great deal; downloads like this are usually as much as the whole DVD, so anyone who likes watching movies on the computer and on their TV are getting a bargain. Overall, the extras on this set are fairly weak, though still stronger than any of the features on the other three film’s DVD sets. There are some good things here though, and the quality of the film makes up for the flaws with the features. This set gets a high-recommendation.